It’s the last weekend before the college football season starts, so you’d think it would be the calm before the storm. But it’s none too calm for PSSI Global Services, as our engineers are coast to coast this week at just about every live event you can think of. Might as well start with football, since it will soon dominate our schedule. This week we’ve got plenty more NFL preseason action. Rick Kolinek and K22 will be at U.S. Bank Stadium in Minneapolis, Minnesota, when the Seattle Seahawks battle the Minnesota Vikings. Then Rick’s finally going to bring K22 back to his hometown of Chicago after one heckuva run in Minneapolis covering soccer, bowling and football. 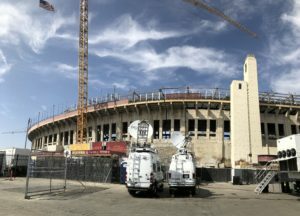 We’ve got a veritable uplink truck jamboree at the Oakland-Alameda County Coliseum on Friday night when the Green Bay Packers face the Oakland Raiders. Project manager Eric Storlie joins production-savvy engineer Matt Huennekens on K19 for expanded coverage of the game for local Wisconsin affiliates. Matt and Eric are making the most of K19’s extensive production capabilities, including switching and data services for the multi-camera show. Steve Chaisson is nearby providing backhaul services for still more broadcasters in the Midwest. And John Jennings is right next to him in NT25 — one of our newly upgraded Ku-band trucks — to provide the game to the local NBC network. Back down in Los Angeles we have a busy weekend with the Chargers and Rams both playing on Saturday. Chris Hovden has the LA Sprinter at the Los Angeles Memorial Coliseum for Saturday afternoon’s Texans versus Rams action. 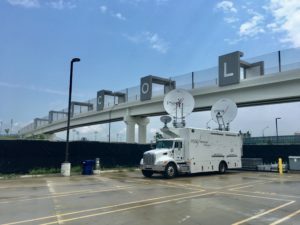 Just down the road at StubHub Center, Rick Ball and Brian Blomstrom are in the CK35 mobile teleport getting set up for CBS’s broadcast of the Saints versus Chargers game. Rick and Brian will be providing CBS with much more than the average uplink, the details of which we are eager to share soon. Steve Hagerty will be at Soldier Field with K18 when the Kansas City Chiefs take on the Chicago Bears in more NFL preseason football action. Mike Lemieux’s in C41 at Heinz Field in Pittsburgh, Pennsylvania, where the Tennessee Titans face the Pittsburgh Steelers. K38, with Marty Smitherman at the helm, will be at EverBank Field in Jacksonville, Florida, as the Jacksonville Jaguars host the Atlanta Falcons. Mike Sheehan will have C43 on-site at Lucas Oil Stadium in Indianapolis, Indiana, when the San Francisco 49ers take on the Indianapolis Colts. We will also have a lot of high school football on our schedules this fall. This weekend Dave Mitchell kicks off a series of games under the Friday night lights in the Pittsburgh region. This Friday it’s the Butler Golden Tornado versus the North Hills Indians. Finally, a little sneak peak for next week’s big college football opener: on Saturday Todd Harvey and C32 are at the Cramton Bowl at Alabama State University in Montgomery when the North Carolina A&T Aggies face the Jacksonville State Gamecocks. After the game, Harvey takes the truck to Charlotte, North Carolina, where we will be in full force for next weekend’s Belk College Kickoff as the West Virginia Mountaineers face the Tennessee Volunteers. Let’s do this! How about a little WNBA playoff action? Brian Blomstrom was at Wells Fargo Arena in Tempe, Arizona, with CK35 on Tuesday for WNBA action when the Phoenix Mercury took on the Dallas Wings and won 101-83, eliminating Dallas from the playoffs. Brian handled a 10-channel at-home transmission for ESPN with ease. Wes Hill is now on his way to Seattle, Washington, where he will handle the transmission for the first two games of the Seattle Storm versus the Phoenix Mercury in more playoff action. Wes has C15 all dialed in for more 10-channel at-home transmissions for our friends at ESPN on Sunday and Tuesday nights. More hoops: Mike Howley and C24 will be at Barclays Center in Brooklyn, New York, on Friday for Fox’s broadcast of the BIG3 Championship. This new basketball league, co-founded by Ice Cube and Jeff Kwatinetz, features mostly retired NBA players competing in 3-on-3 games. This is the championship game of what has been a great run of basketball across the country. We’ve also had a lot of cricket on our schedule this summer. Steve Toth wrapped up coverage of the Caribbean Premier League cricket matches on Wednesday at the Central Broward Stadium in Lauderhill, Florida, when the Jamaica Tallawahs took on the Barbados Tridents. Steve’s getting some well-deserved PTO before his weekends start to fill up with football. It’s still a big racing weekend even though NASCAR’s Monster Energy Cup series is taking a week off. Justin Roszak and C12 are back at Road America in Elkhart Lake, Wisconsin, to bring us more wheel-to-wheel and door-to-door racing action with highlights to include the NASCAR XFINITY Series Johnsonville 180, the Stadium Super Truck Series presented by Menards and the SCCA Pro Trans Am Series. Nick Ray’s in C42 — with a hand from Rick Ball setting up — at Canadian Tire Motorsport Park in Bowmanville, Ontario, for one of the busiest race weekends of the summer. The events include the NASCAR Camping World Truck Series Chevrolet Silverado 250, NASCAR Pinty’s Series, IMSA Ultra 94 Porsche GT3 Cup Challenge Canada by Yokohama, Canadian Touring Car Championship and Nissan Micra Cup. Nick is handling the encoding and transmission of 14 channels of video for our friends at Fox and NASCAR. Nick stays north of the border after the show for some WWE action, as well. Driver Joe Kelderhouse will be parking and setting up the CK30 mobile teleport at Scotiabank Arena in Toronto for Monday Night Raw and Tuesday’s SmackDown. Still more action north of the border, eh? Before heading to Chicago for football, Steve Hagerty was in Montreal, Quebec, on Thursday night for the Bud Light House Party Tour featuring electronic dance music duo NERVO. Larry Sheets and C45 are at the OSU Scarlet Course in Columbus, Ohio, for the Nationwide Children’s Hospital Championship. Up north, Dave Brin has C49 on-site at the Wascana Country Club in Regina, Saskatchewan, for the CP Women’s Open. Dave Meyer and the Atlas truck are in the Pacific Northwest at The Club at Snoqualmie Ridge for the Boeing Classic. Kevin Spangler and C31 are at Ridgewood Country Club in Paramus, New Jersey, for the Northern Trust championship. Tennis-wise, Benny Griffis and NT29 are in Winston-Salem, North Carolina, this weekend at the Wake Forest Tennis Complex for the Winston-Salem Open, a professional men’s tennis tournament played on the ATP tour, with the winner taking home a portion of the over $650,000 prize pool. 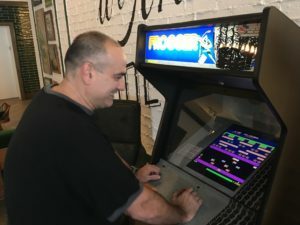 Benny and Dave Buckman will be watching each other’s work, as Dave’s also covering tennis at the Cullman-Heyman Tennis Center in New Haven, Connecticut. There it’s the Connecticut Open, a women’s professional tennis tournament on the WTA tour with a prize pool of more than $750,000. These events are more in a series of exciting ATP tennis matches that we’re proud to do every year with our friends and partners at Concom. Speaking of Concom, there’s more Concom-produced UFC action this weekend. 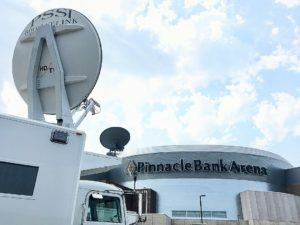 Jim Flowers, Ray Loyko and the newly refurbished CK25 mobile teleport are at Pinnacle Bank Arena at the University of Nebraska in Lincoln for UFC Fight Night. Project manager Keith Valeri is also on hand to manage all of the transmission paths for Gaethje versus Vick in the main event. Other match-ups include Michael Johnson facing Andre Fili, Cortney Casey battling Angela Hill, Jake Ellenberger taking on Bryan Barberena, John Moraga fighting Deiveson Figueiredo, and Eryk Anders and Tim Williams going toe-to-toe. As always, it will be an exciting night of fighting and a flawless night of domestic and international broadcasts with our ace UFC team. A little boxing this weekend, too. Joe Cox and K33 join project manager David Gallardo at Gila River Arena in Glendale, Arizona, on Saturday for Top Rank Boxing on ESPN when Raymundo Beltran faces Jose Pedraza. The co-main event will feature Isaac Dogboe battling Hidenori Otake. David and Joe will handle the international distribution of the main event and all the undercards. And look out! We’ve got more bare knuckle boxing, live in 4K! 4K guru Rick Varney is heading up another big group effort as PSSI Global Services continues to expand its 4K offerings. 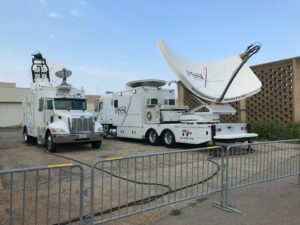 Chris Golden and John May are in two of our finest C-band trucks to provide the transmission while Mr. Varney handles the extensive 4K and HD encoding and monitoring from his command center. We are continuing to work with our friends at Ericsson to provide cutting-edge 4K compression solutions for our customers. This event in Biloxi, Mississippi, is a big one: it’s the Bare Knuckle Fighting Championship 2 pay-per-view, live from the Mississippi Coast Coliseum and Convention Center. Highlights will include Bec Rawlings battling Britain Hart, and the semifinal round of the BKFC heavyweight tournament with Sam Shewmaker taking on Maurice Jackson and Arnold Adams facing Joey Beltran. We’ll finish up with a somewhat calmer event this Sunday in beautiful Pebble Beach, California. It’s the 2018 Concours d’Elegance, the top collector car competition in the world. John Bright, Dan Patin and Nathan Holsey are setting up our K34 production/uplink hybrid for a multi-camera production of the time-honored event, which takes place on the 18th fairway of the Pebble Beach Golf Links. There will surely be some beautiful cars on the California coast this weekend, and we’re happy to be there to bring the event to car collectors and admirers around the world. Find the current time anywhere in the world or compare the time table. © Copyright 2019 PSSI Global Services | Strategic Television | PSSI Strategic | Global Times are based on your computer's time setting.